Drug Abuse Treatment Association (DATA) is Southeast Florida’s premier behavioral health agency serving youth and families. Our team of over 100 experienced and dedicated staff provide a full continuum of behavioral health services including outreach, prevention, intervention, Treatment Accountability for Safer Communities (TASC), outpatient, and residential treatment to communities in Palm Beach, Martin, Okeechobee, St. Lucie, and Indian River counties. In addition to our two outpatient and residential facilities in West Palm Beach and Ft. Pierce, we are also co-located in schools, Department of Juvenile Justice facilities, and with other community partners. If you have a “Can Do” attitude and are committed to doing what is in the best interest of the youth, families and communities we serve, we encourage you to consider joining our team. 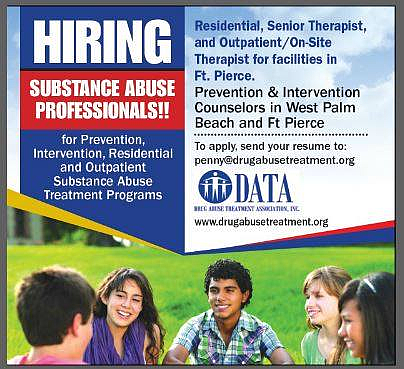 If you would like additional information regarding the agency or the career opportunities below, please contact our friendly Human Resources Department at HR@DrugAbuseTreatment.org or at 561.743.1034. A minimum of a Bachelor’s Degree with prior experience working in a residential program and working with adolescents and families, preferred. Experience may be substituted in lieu of education. Preference for experience working with youth with behavioral challenges and juvenile justice involvement. Must be able to navigate Microsoft Word and Excel programs and web-based platforms. Communication and organizational skills are critical in this position. Bilingual a plus. Provide leadership, employee orientation, and ongoing training and supervision to resident managers and other staff as appropriate; and Complete and submit all required paperwork in accordance with agency, accreditation, and legal requirements. Must be able to pass a Level II Background Screening and a urinalysis test, have a valid Florida Driver’s License, and not more than one moving violation during the immediate 3-year period prior to employment. Bachelor’s degree in the behavioral health field with prior experience working with adolescents in a group environment (i.e., emergency shelter, group home, residential facility, etc.). Design and implement creative, on- and offsite experiences/activities that enhance the social, behavioral, therapeutic, academic, and personal development of the clients. Embrace and enforce the rules and policies of the agency and residential facility at all times, and quickly evaluate crisis situations and respond appropriately. High School Diploma or GED required, Bachelor’s degree preferred. Individuals experienced with working with youth with behavioral health issues strongly encouraged to apply. Document information regarding a youth’s behaviors and performance. A minimum of a Bachelor’s Degree in an accepted behavioral health field with at least one (1) year prior experience conducting bio-psychosocial assessments, case management, individual, family, and/or group therapy. Master’s Degree strongly preferred. Experience in navigating Microsoft Word and Excel and web-based programs is essential. Preference for experience working with adolescents with behavioral health challenges. Organizational and communication skills are critical in this position. Bilingual a plus. Advocate for the client and their family. Must be able to pass a Level II Background Screening, Department of Juvenile Justice Screening and a urinalysis test and have a valid Florida Driver’s License and personal, reliable transportation. Hours of Position: High Schools Monday – Friday, 7:00 am – 3:00 pm; Middles Schools Monday – Friday, 8:30 am – 4:30 pm. Must have a Master’s Degree in the healing arts from an accredited university or college with a major in the field of counseling, social work, psychology, nursing, rehabilitation, special education, health education, or a related human services field with a minimum of two years of professional experience in providing services to persons with behavioral health disorders. Experience in navigating Microsoft Word and Excel and web-based programs is essential. Preference for experience working with adolescents and substance use. Bilingual a plus. Case Management: Provide care coordination and advocacy activities on behalf of students, including collaborating with the student’s families. Call us to find out how to qualify for having a school schedule yet get paid for 12 months with Holidays, Winter Break, Spring Break, and time off in the summer. Must be able to pass a Level II Background Screening, Palm Beach County School District Background Screening, and a urinalysis test and have a valid Florida Driver’s License and personal, reliable transportation. Hours of Position: Palm Beach County High Schools Monday – Friday, 7:00 am – 3:00 pm; Middle Schools 8:30 am – 4:30 pm. Hours vary by school in Indian River and St. Lucie counties. Participate in school-based teams as requested by schools. Must be able to pass a Level II Background Screening and a urinalysis test and have a valid Florida Driver’s License and personal, reliable transportation. education, health education, or a related human services field with a minimum of two years of professional experience in providing services to persons with behavioral health disorders. Experience in navigating Microsoft Word and Excel and web-based programs is essential. Preference for experience working with adolescents and substance use. Bilingual a plus. Participate in multidisciplinary case conferences with clients, staff, and stakeholders. Must be willing to provide behavioral health counseling in a client’s home, be able to pass a Level II Background Screening and a urinalysis test, have a valid Florida Driver’s License, and insured personal, reliable transportation. Hours of Position: Palm Beach County High Schools Monday – Friday, 7:00 am – 3:00 pm; Middle Schools 8:30 am – 4:30 pm. Hours vary by school in Indian River County. Must have a Master’s Degree in the healing arts from an accredited university or college with a major in the field of counseling, social work, psychology, nursing, rehabilitation, special education, health education, or a related human services field. Experience working with youth with behavioral health issues preferred. Experience in navigating Microsoft Word and Excel and web-based programs is essential. Bilingual a plus. Participate in school-based meetings when requested. Must be able to pass a Level II Background Screening, School District background screening, urinalysis test, and have a valid Florida Driver’s License, and insured personal, reliable transportation.